read Matthew 10. In this chapter, Christ sends out his 12 apostles with a list of warnings, encouragement, and instructions. One of his first instructions is: “Give as freely as you have received”. Matt. 10:8. John Yenchko, the pastor of North Shore Community Church, once gave a sermon about giving in which he put up a picture of a tiny little stream, trickling down over some rocks. He said this little stream represented our love poured out to other people. Then he put up a picture of Niagra Falls. He said that that enormous waterfall represented God’s love poured out to us. The only way we can give to others, he said, is if we take time to experience the waterfall. “Put on your own oxygen mask before you put one on someone else,” they always tell us on airplanes. Otherwise, you’ll both pass out. When we feel depleted, empty and hollow, it’s a sign that we have run out of God’s love. Being a Christian is not about taking a list of instructions and trying to follow them. That’s religion, and it will kill you and all those who come near you. Being a Christian is about having a living breathing relationship with the God who made us. When I feel depleted, that’s when I know I’m running on “Caroline” and not on God. I’m running on fumes. When we feel that way, it’s time to turn back to God. Refuel me, is the cry of our hearts. Fill us back up with you. We need to spend time with God, sitting still, soaking in his love. We forget that when Christ gave his disciples this entire chapter of instructions, he is sitting there with them, in person. We have to sit at Christ’s feet, too. We can’t just expect to read the instructions all by ourselves and run with them. Only if we spend time with Christ can we go out into the world in the way he discusses in this chapter. Only if we sit with our shepherd can we go “as sheep among wolves”. Only if we’re filled with his joy can we handle the trials Christ warns of here. Only if we’re filled with the Spirit can we trust that God will give us “the right words at the right time.” It’s only when we know, deep in our hearts, that God will never abandon us, that we can handle it when our parents, siblings or children “betray” us, as Christ says they will. Only if we have a deep sense that God loves us, can we maintain peace when the world “hates” us. It’s perfect love, the Bible says, that casts out fear. We need to lie down in green pastures and sit beside still waters in order to have even a ghost of a chance of believing that we are more precious than sparrows and that God knows even the number of hairs on our head. We will always cling to our own lives, until we begin to cling to Christ more desperately. It’s the clinging to Christ, that’s the true definition of success. 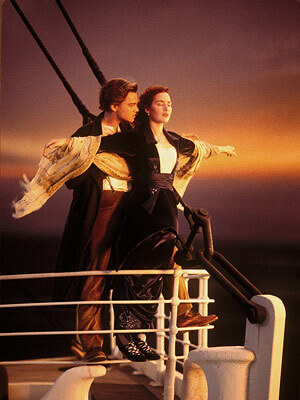 We are to be like Kate Winslet clinging to her raft as the Titanic sinks; we are to be clinging to Christ as if he’s the only thing that stands between us and certain death. When we do that, we often feel like we’re failing, but in God’s eyes, we’re succeeding. In clinging to Christ in total surrender, it’s as if we’re standing on the prow of God’s ship, with our arms wide and hearts extended – and someone even better than Leonardo Dicaprio has his arms around us, someone who stretched out his own arms wide for us on the cross. From that place, we can give with joy and abandon, because we are freely receiving all the love in the universe. Any chance of turning these into podcasts as I prefer to listen to things, you could just speak into a mic, save it in iTunes and share it (I think).